FameLab® is an initiative of the Cheltenham Festivals. 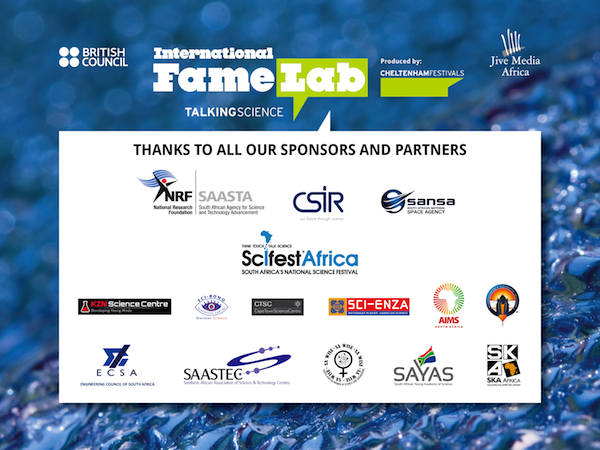 Jive Media Africa in collaboration with The British Council has brought the international FameLab® competition to South Africa in 2013. From left: Prof Janice Limson (Judge), Lorenzo Raynard (SAASTA/ Judge), Robert Inglis (Director, Jive Media Africa), Febe Wilken (runner up), Barend Jansen van Vuuren, Christopher Maxwell, Ntokozo Shezi, John Woodland (runner up), Ahmed Seedat, Charlotte Hillebrand, Michelle Knights (overall winner), Charmaine Drury, Prof Albert Modi (UKZN Dean, Judge), Remo Chipatiso (British Council), Prof Himla Soodyall (Judge). 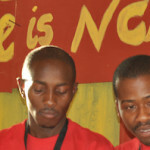 Nine finalists took to the stage at Scifest Africa in Grahamstown for the FameLab South Africa 2013 final. In front of a capacity crowd, the finalists presented a range of interesting and diverse 3 minute talks. The audience cheered on their favourites, but ultimately only one contestant could be named FameLab SA 2013 winner. The prize went to Michelle Knights, a SKA student from Cape Town who was named the first ever South African FameLab winner. She receives a R10 000 cash prize as well as a trip to the UK to compete in the International FameLab final in June 2013. Runners-up were John Woodland also from Cape Town and Febe Wilken from Johannesburg who both receive a cash prize. 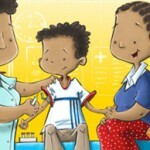 The event generated much excitement and brings new perspectives on science in South Africa. Regional winners walked away with great prizes and the opportunity to hone their presentation skills with leading UK-based trainers before competing in the National Final at SciFest Africa 2013 in Grahamstown. FameLab® is an international competition dubbed “Pop Idols for scientists”. It seeks out new voices in science, technology, engineering and maths – developing science communication skills and profiling role-models to inspire the next generation of scientists. Since its inception at the Cheltenham Science Festival in 2005 it has spread to 23 countries around the world. Let’s work together to excite and inspire South Africans with a new vision for science and technology! FameLab® © Copyright Cheltenham Festivals Ltd.